CINCINNATI -- Fentanyl, a drug that delivers a heroin-like high but is far deadlier, is the new killer drug plaguing this community. Fentanyl abuse caused a sharp spike in deaths in Southwest Ohio last year, and this region has emerged as the worst spot in the country for it. In Hamilton County alone, fentanyl was a factor in the deaths of 344 people last year, according to the Hamilton County coroner's office. That’s more than double the deaths from 2014, when 126 died. That's more than 400 deaths from fentanyl in one county in just two years, a stunning, exponential increase in fatality from years before. A similar spike in deaths is happening in other Southwest Ohio counties and in Northern Kentucky. Before 2014, fentanyl abuse barely registered as a problem. In 2013, the number of fentanyl deaths in Hamilton County was 13. In 2012, nine. Now, fentanyl is killing as many people here as heroin. The situation is especially urgent in Southwest Ohio. Last fall, a team of investigators from the Centers for Disease Control and Prevention traveled to Ohio to analyze the epidemic of fentanyl-related deaths. The team examined 14 counties with a high number of deaths, including four in Southwest Ohio -- Hamilton, Butler, Clermont and Warren. The CDC just released its report, a 50-page document that found this corner of the state to be the worst region in the nation's worst state. The CDC ranked Hamilton as the worst county in Ohio for fentanyl-related deaths. Butler County was ranked fourth-worst, Clermont sixth-worst and Warren County 11th of 88 counties. A similar trend is happening in Northern Kentucky, although on a smaller scale. Boone, Kenton and Campbell counties are all on track to double the number of fentanyl deaths they experienced in 2015. The death toll there is still rising even after what the Northern Kentucky Drug Strike Force called "an abrupt increase" in fentanyl deaths in 2014. Final Northern Kentucky numbers for 2015 are still pending. 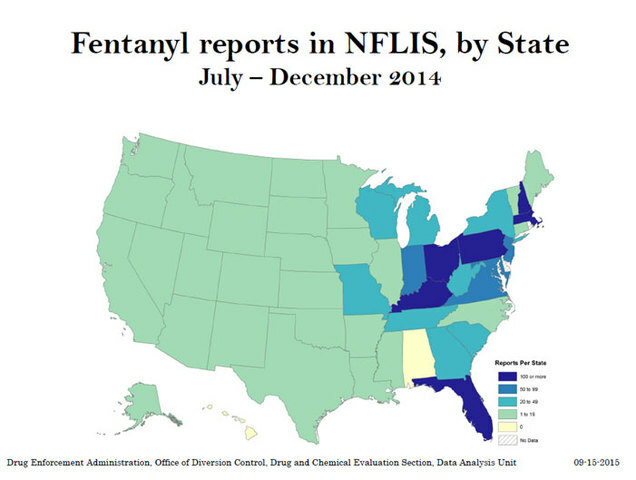 Ohio and Kentucky are fentanyl hotspots, the DEA says. Fentanyl is a legally manufactured, prescription drug mainly intended to relieve the suffering of end-stage cancer patients. It's sometimes prescribed in the form of a skin patch, with the brand names of Duragesic or Actiq. But it's also illegally manufactured by clandestine labs, and much of what ends up on our streets is from these rogue labs, says the CDC and other sources. There appears to be an international network for the illegal manufacture, distribution and sale of bootleg fentanyl. Much of it is winding up here and killing people by the hundreds. "Ohio and Kentucky are awash in fentanyl," said Dr. Judith Feinberg, a Cincinnati drug abuse expert. "For some reason, more fentanyl is reaching Ohio than anywhere else." Some of the drug is believed to be made in secret labs in Mexico. Some of it may be coming from China, earning it the nickname of “China White” among users, the CDC says. Some of the chemicals used to make bootleg fentanyl have come from Germany and Japan, the DEA has reported. One Ohio user bought it from a dealer who sourced it over the Internet from Hong Kong, the Ohio Substance Monitoring Network has reported. For reasons that aren’t clear yet to law enforcement or public health officials, this part of Ohio is a hotspot for the illegal dealing and abuse of this deadly drug. The Hamilton County Heroin Coalition issued a warning about fentanyl in February, saying the drug is "producing frightening results and requires even more tools and awareness to combat." Newtown Police Chief Tom Synan, a leader of the coalition, says, "We haven't been able to figure out why here. It's almost like we're one step behind." Ohio is by far the top state in the country for seizures of illegal fentanyl, the U.S. Drug Enforcement Administration reports. Ohio ranked number one in 2014 with 1,245 confiscations, nearly double the number of the next state, Massachusetts, which reported 630. Like a virus, it has spread beyond Ohio's borders. Surrounding states also made the DEA's dubious top ten list: Kentucky was sixth, with 232 seizures, and Indiana was tenth, with 133. With that level of confiscation, and much more certainly being dealt, this region of the country has become a crossroads for the illegal trade of fentanyl. "With Ohio leading the country, Kentucky ranking sixth and Indiana at tenth, one can surmise the area reaping the impact of this problem is the Tri-State, Greater Cincinnati metropolitan area," says the Northern Kentucky Drug Strike Force report. Fentanyl is so deadly because it is 50 to 100 times more potent than heroin. Sometimes fentanyl is mixed with heroin or cocaine. Sometimes it is sold alone. Sometimes addicts know what they are getting; sometimes they don't. Some addicts seek it out precisely because it is so powerful, Synan says. They seek it out even after knowing someone who's overdosed on it. Bootleg fentanyl is often mixed with heroin or cocaine. Addicts may not even know that it’s in the doses they bought from their suppliers. That’s partly what makes it so fatal. Injecting a drug 50 times more powerful than the drug you think you bought is a recipe for death. Fentanyl overdoses can be resistant to the overdose antidote naloxone, or Narcan, making its abuse even more dangerous. Naloxone was given in more than 40 percent of the fentanyl deaths CDC investigated. Multiple doses may be needed to revive an overdose victim, leading the CDC to recommend that emergency responders be trained in administering multiple doses of the overdose drug. Despite the rapid increase in fentanyl deaths, few alarms have been raised by public health and law enforcement agencies, other than the county task force alert two months ago. That frustrates Dr. Feinberg, a nationally recognized expert in public health who worked most of her career at the University of Cincinnati before moving to the University of West Virginia. "To me, the overall silence around fentanyl is ominous," she said. WCPO's Heroin Project: How Do We Respond?